Extraordinary savings and returns are associated with an investment in energy efficiency and Financial Energy makes these upgrades available to customers who don’t have the capital. Financial Energy can provide 100% of the up-front financing. We are then compensated through the monthly utility savings. When the improvements are paid off, the subsequent savings are yours. If you have money budgeted to pay current utility bills, then you have the funds necessary to invest in energy efficient upgrades! All of these options require that the customer meet a fixed monthly payment based on the value of the equipment installed. Financial Energy guarantees that the combined monthly savings (energy, water, maintenance, AC) will cover these fixed finance payments. 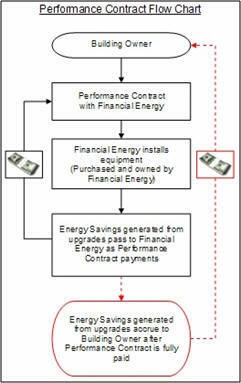 The customer enters into an Energy Services Agreement with Financial Energy to cover the cost of the equipment and maintenance. The performance contract includes the terms of the guarantee, savings calculation methodology and the equipment warrantee. 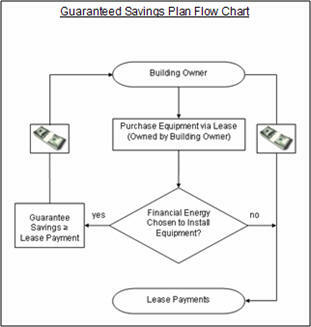 Any savings shortfalls are covered by Financial Energy for the term of the energy services agreement. Many utility providers offer rebate programs that provide cash incentives for purchasing qualified energy efficient improvements. These programs are often only available for a limited time, and are offered on a first come, first serve basis. Financial Energy has taken part in such programs in numerous states, and can help your company take advantage of existing gas and electric rebate programs in your area. During the audit process, we will research and estimate the value of your potential rebates and will present them with the rest of the audit report. The property-assessed clean energy (PACE) financing method is a relatively new mechanism for financing energy efficiency and renewable energy improvements on private property. PACE allows a building owner to finance improvements through a special assessment on the property, which is paid back over time by property tax collections (typically paid for by the tenants in commercial buildings). Property owners agree to repay their improvement costs over a set time period- typically 10 to 20 years- through property assessments. These assessments are secured by the property itself and they are paid as an addition to the owners’ property tax bills. Nonpayment generally results in the same set of repercussions as the failure to pay any other portion of a property tax bill.